iOS file managers for iPhone and iPad generally comes in different features. Some manage files locally, some allow for cloud storage, and others not only organize your files but also transfer them to computer for backup. Just check out some of the best file manager for iOS 12 devices below! iOS system is simple and easy to use, but the lack of a file managment tool makes it challenging to control files in iPhone and iPad. That's why iOS file managers are needed. Here is a list of best iPhone/iPad file managment software that you can use to organize and backup media files, folders, documents and even cloud storage easily. MacX MediaTrans, serving as the tool to manage iOS files, lets you easily backup iPhone iPad music, photos, videos, movies, ebooks, ringtones, etc to Mac and vice versa, safe & fast! Manage iOS music files - batch organize songs according to artist and genre; create, edit and delete playlist; transfer music from iPhone/iPad/iPod to Mac and vice versa. Organize videos & movies – import/export 4K videos, movies, or HD recordings on iPhone iPad; convert videos in batch; auto rotate sideway videos. Backup iOS photos – group photos by day, month, or year; transfer pictures, live photos or even entire library from iPhone iPad to Mac (macOS Sierra/Mojave) in a flash and vice versa. Use iPhone as Flash Drive – use iPhone as a USB flash drive to backup Word, Excel, PDF, DMG, EXE, Apps, etc. 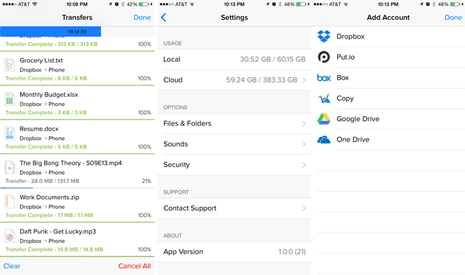 Unify is an iPhone file manager app that lets you access all of your Cloud accounts with ease. You can download files to your iPhone XR, XS, XS Max for iOS file managing purpose. Simultaneously, you are able to quickly transfer files between any of your cloud accounts or search a file through all accounts. Moreover, it allows you to stream video and music files, browse PDF and other document files like Word, Excel and more. There's also a TouchID support and a passcode capability. * Unify all of your cloud accounts in one place, including iCloud, Dropbox, GoogleDrive, etc. * Quickly search and transfer files in all iOS Cloud accounts. * Preview and decompress Zip or RAR files directly. * Stream videos and music to built-in player or download media files for offline playback. * Read comics, PDF, Word, Excel, and more document files. * Support TouchID and password protection. 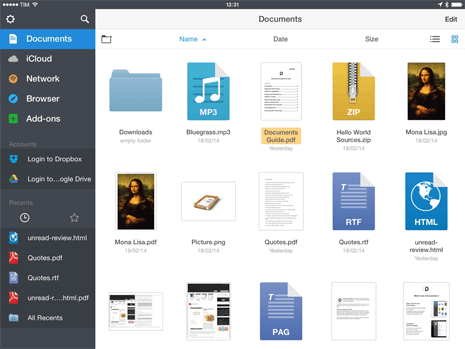 Documents 5 is an iOS file manager app that focuses more on document organization on iPhone and iPad. It enables you to move, copy and delete files from the internal memory of your iPhone iPad. It also lets you annotate PDF and sync files with cloud storage platforms such as iCloud, Dropbox and Google Drive. You can even import documents directly from email attachments and web pages if needed. What's more, password protection can also be used to keep your files safe and secure. * Open all sorts of files from videos to Office and books. * Read and annotate PDF files. * Transfer files from Mac/PC to your iPhone iPad and reversely. * Auto and fast cloud synchronization with iCloud, Dropbox, Google Drive. * Download attachments from emails and web pages in one click. * Protect every file and document with a password. iStorage 2 HD app is the ultimate file manager for advanced iOS users. It allows you to view, search, transfer and manipulate files right on your iPhone and iPad. And it has the ability to view two different folders on screen at once, which comes in handy when comparing two files, or when you want to move files between two different locations. Besides, iStorage 2 lets you read Windows Office documents and PDFs right within the app, and synchronize all files to Dropbox and SkyDrive. The app even has a paid Web browser and bookmarks manager. * Transfer and share files with Mac using Wi-Fi or Bluetooth. * Open Zip, RAR, PDF, RTF, TXT, Word, Excel, PowerPoint and Apple iWork files. * Download or upload files from and to Dropbox, Google Drive, Skydrive, etc. * Manage, view and edit photo library and sync photos to cloud. * Edit the source code (for programmers) and line numbers. * Connect to any FTP, SFTP or web server, view and edit files on the network. 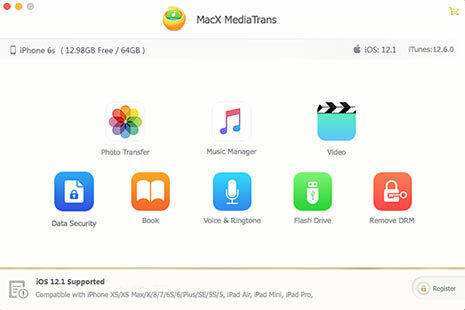 MacX MediaTrans, world's No.1 fast iOS file manager, supports you to easily transfer and backup iOS 12 iPhone iPad music, photos, videos, ebooks, ringtones, etc. to computer and vice versa. The Problem of Move to iOS App Not Working Resolved!